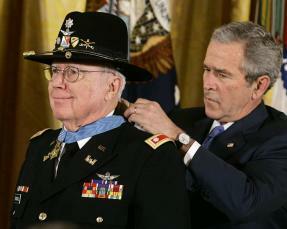 President Bush bestowed the Medal of Honor Monday on retired Lt. Col. Bruce Crandall in a White House ceremony. In a recent interview, the honoree said he can’t stop thinking about the men on the ground who inspired him to repeatedly expose his helicopter to intense enemy fire during the Battle of Ia Drang 42 years ago. The retired Army helicopter pilot said it was “the bravery of the infantry on the ground” that he remembers most about that fierce fight in November 1965.